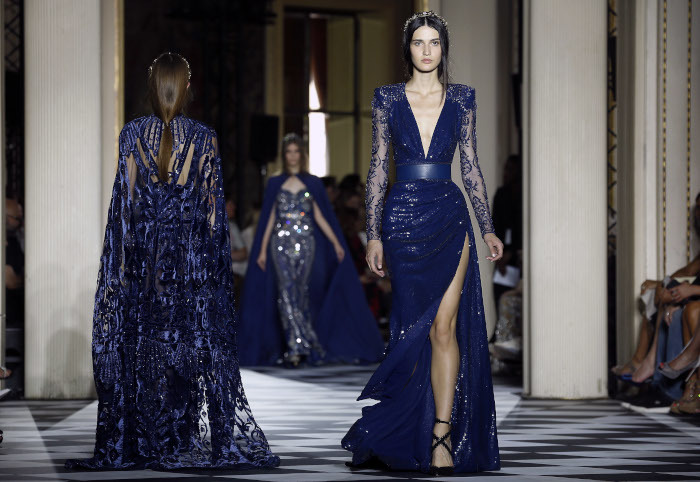 It’s always about opulence in Zuhair Murad’s collections. The Lebanese designer presented his Fall 2018 Couture lineup filled with heavy embellishments, rich fabrics, and colors. 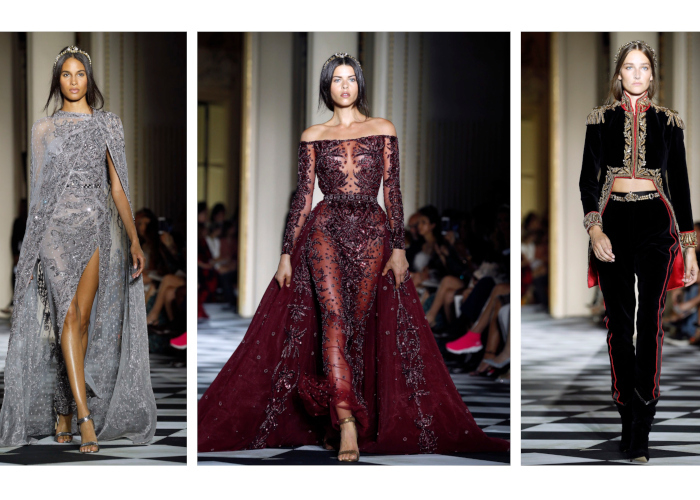 You simply can’t divide couture from Zuhair Mourad. Glam and extravaganza are in the brand’s DNA and what the designer knows best. The Fall 2018 Couture collection is everything you’ve expected and more. This collection seems more serious and womanly than his previous ones. 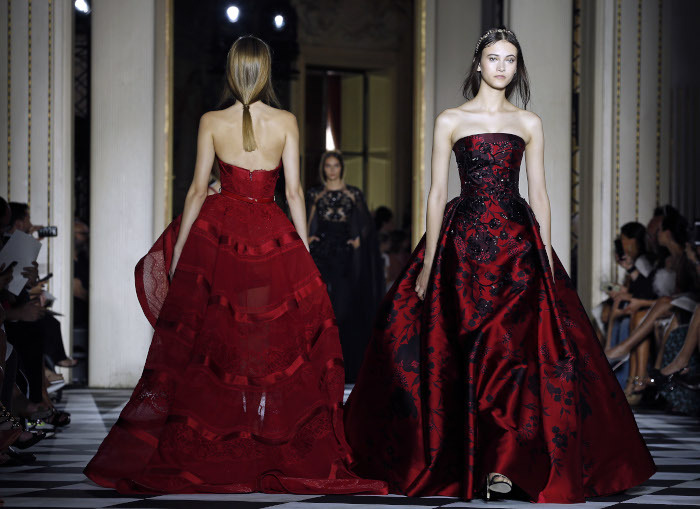 The designer used elegant fabrics such as velvet, chiffon, and Duchesse satin in darker colors such as crimson red, wine, black and deep ocean blue. The breathtaking embellishments added both on weight and glamour. Some of these designs are notably heavy and it takes strong women to pull them off. The Zuhair Murad Fall 2018 Couture collection was inspired by the Russian czars and czarinas. Expectedly, they had a luxurious taste. But it wasn’t only their delicate sense of fashion that inspired the designer to create these bespoke designs. Zuhair Murad has a lot of Russian clients who according to him are beautiful but also have a strong character. The same goes for these couture designs, they are elegant and feminine yet radiate power. Murad even involved military details on some of his designs. There is a velvet suit with gold and red embroidery filled with military elements but very feminine at the same time. Although there are nods to the Russian aristocracy, Zuhair Murad wasn’t stuck in a single period while making the Fall 2018 Couture collection. All of the looks are very relevant to nowadays red carpets. The designer is a favorite of many A-list ladies. Some of them were watching the Haute Couture show from the front row, covered in sequins. Murad’s most loyal fans even topped their opulent looks with tiaras. Excessive glamour was everywhere – both on and off the runway. The bride was also a queen. 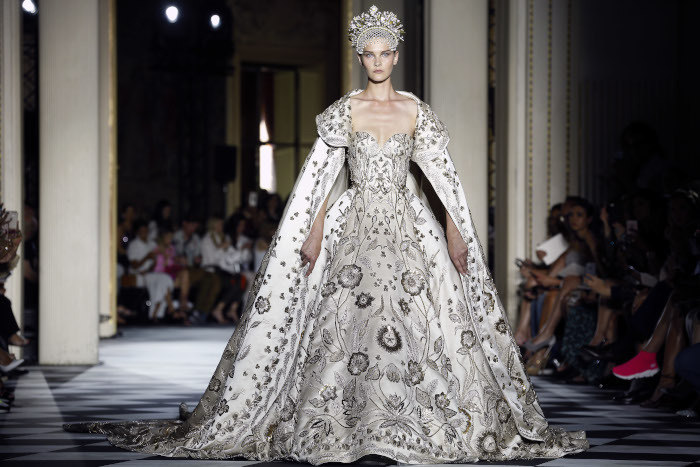 The final design was an over-the-top glossy wedding gown covered in delicate gold floral embroidery. The voluminous corset dress was accompanied by a grandiose matching cape. Lastly, the bride donned a luxurious crown featured sparkling jewels and floral motifs that perfectly matched the impressive gown. According to the designer, it took thousands and thousands of hours to embroider the appliques on this dress. Note for the real-life bride who’d decide to make this her dress of choice for her big day: “It’s a little bit heavy. You need to be a strong woman to wear it,” Murad admitted.